Team USA, featuring four Terrier 2018 commits, will seek to repeat as gold-medal winner in the IIHF 2018 World U18 Championships in Magnitogorsk, Russia beginning Thursday. Joel Farabee, Jake Wise, Jack DeBoer, Tyler Weiss and their teammates will take on Team Canada in the first preliminary round game. It will air live on NHL Network at 10:30 a.m. ET. A replay will air at 7:30 p.m. ET. 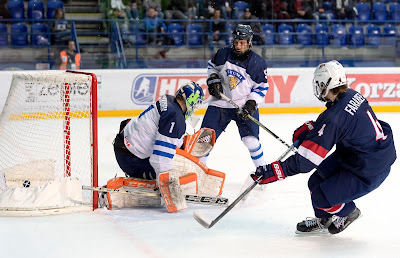 Farabee played in last year’s World U18s, scoring 6 points in seven games including two goals in the gold-medal game. Wise, DeBoer and Weiss all won gold for Team USA in the 2016 Youth Olympic Games. Team USA is in Group A and will also face Belarus, Sweden and Switzerland. Brady Tkachuk and five BU recruits were among those in NHL Central Scouting’s final ranking for the 2018 Entry Draft. Among North American Skaters, Tkachuk is ranked #2, followed by Farabee #12, Wise #38, Weiss #90 and DeBoer #166. The last four are 2018 recruits. 2019 recruit Vinnie Purpura was ranked #23 among North American goalies.